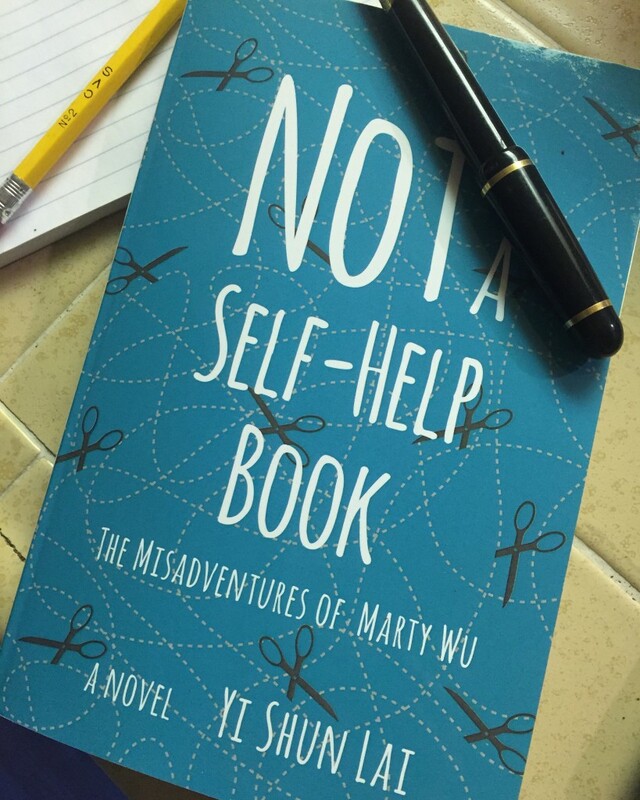 A little background: Marty Wu, the book’s protagonist, is a compulsive reader of advice manuals, who dreams of presenting herself as a poised young advertising professional. Instead she trips over her own feet and blurts out inappropriate comments. The bulk of her brain matter, she decides, consists of gerbils “spinning madly in alternating directions.” After a career meltdown that sends her ricocheting between the stress of New York and the warmth of supportive relatives in Taiwan, she faces one domestic drama after another, including a formidable mother who’s impossible to please, an annoyingly successful and well-adjusted brother, and surprising family secrets that pop up just when she doesn’t want to deal with them. Sharon: Marty, your book’s protagonist, tells us her story thru diary entries. Perhaps because of the form and the nature of Marty’s misadventures, there have been the inevitable comparisons to Bridget Jones Diary. Can you tell us why you chose that form and how that influenced your writing of the story? Yi Shun: It happened in the most organic of fashions and it was by no means an easy or quick route. I messed around with a few different forms: from first person to third to first again, until finally settling into epistolary form. In the end, it was the character herself who demanded it. The voice itself is a key part of what I believe, ultimately, is a re-telling of the American success story. While I was writing, I imagined that the voices of the young women who were the stereotypical “good girls” of any culture would be a lot louder than we were told or imagined. That voice had to speak for itself. Therefore, diary. Sharon: You were born in Taiwan and raised in American, like Marty. Are there elements of Marty’s story that relate to your own life? Yi Shun: Oh, sure. Certainly the overarching themes and philosophy of the story relate. And when I was a lot younger, I was convinced that my experiences were unique. Oh, was I wrong. So although the book reflects some of my experiences, it also draws from so much of what I have been told, and witnessed. A book that’s ostensibly about one culture also resonates with others. Writing and reading are beautiful things that way: they presents opportunities to connect with other cultures. Sharon: How much did Marty’s bi-cultural background play into her personality? Are there parts of her make-up that you see as typically Taiwanese or typically American? Yi Shun: At this stage in her life, Marty would say that who she is comprises much of how she was raised. Her quick tongue, I think, is biologically inherited. But her confusion is entirely a product of her bicultural upbringing. The answer to your question though is, a lot. Marty thinks she’s uniquely damaged because of her bicultural background, so we’ll respect that, even if she’s not unique in this regard, or not even particularly damaged in the grand scheme of things. She’d also say that her bounce-back mentality is stereotypically American, and that her need to please her parental unit is stereotypically Taiwanese. But I think we, as readers, can see that the things she’s struggling with are more human than they are any one particular ethnicity. Sharon: You do a great job of telling a serious story with humor, which I found particularly important in the scenes between Marty and her critical-bordering-on-abusive mother. Was that a challenge, finding a good balance when you were writing? Yi Shun: Yes. Someone asked me recently what I’m most proud of in this book. I hadn’t ever thought about it earlier, but now that I’ve had a chance to consider, I think it’s exactly what you posit above: Trying to show everyone a glimpse of what this alternate American experience could be like, while preserving Marty’s voice. Sharon: This one is for all the writers out there. How long was this idea simmering before you felt was ready to start submitting to agents or editors? Yi Shun: Oh, gosh, a long, long time. I first started thinking about what it means to be American when I was in college, and started thinking more critically about my experiences—what they meant, and whether or not it was worth it to try and tell this story. But it wasn’t until a long time after that when I started thinking that a novel would be the right way to tell this story. Once I started writing the novel, I think it was a long, cool decade before it got published. Sharon: Can you share what your working on now? Yi Shun: With pleasure! I’m working on a novel that involves some time travel: and Ernest Shackleton, one of the greatest explorers ever. I’m pretty excited about this project…but first, there’s marketing, and book promotion, and so many more other readers and writers to meet.